Pick-Up Time CSA share pick-ups will be once a week, every Thursday from 3:30-6:00 pm. If that time doesn’t work for you, members are also welcome to pick up their shares when the farm store is open. Pick-Up Style. The majority of our vegetables will be pre-harvested and set out market-style under our pavilion or in the farm store once the weather turns cooler. Members will fill their shares based on what's available and abundant. We will provide guidelines about how much of each crop to take. Members take either 8 (small share) or 12 (large share) items each week, of whatever composition they want. What's an item? Our latest way to provide flexibility to share members. You can mix and match depending on what your menu will be that week. Think, 1 bunch kale, 1 lb potatoes, 1 pint cherry tomatoes, etc. You can mix, match, and double up on items as you wish. Pick-Your-Own Gardens! We are also excited to incorporate pick-your-own (PYO) harvesting into our CSA membership. This works best for certain produce, like cherry tomatoes, peppers, herbs, cut flowers, and string beans. 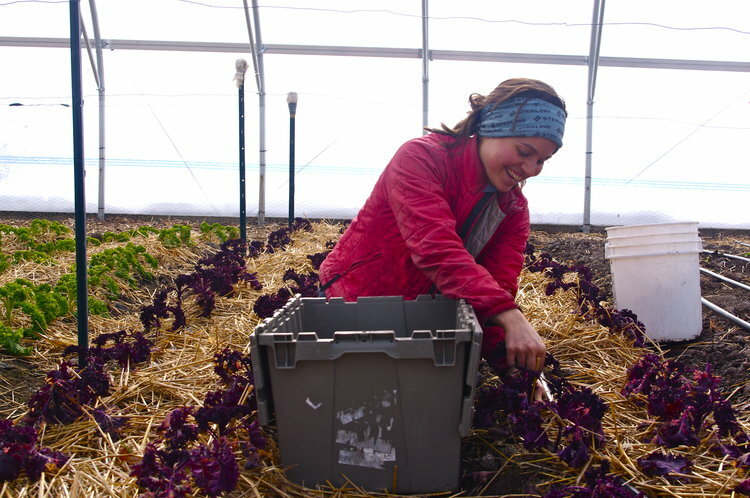 PYO helps us out a lot by lessening the amount of up-front work we must do to prepare our CSA shares. It also means we don't over or under harvest, which reduces our waste. We also know that many of our members love the chance to spend time in our gardens and hoop houses, hanging out with the plants, and picking their favorite foods. We see this as great opportunity for members to get to know us and the farm a little bit better. We will have some PYO crops pre-harvested for those who don't have time during the pick-up window. Meat Share Add-On. Purchase a Meat Add-On to your Veggie Share. A variety of cuts will be available, including: Shoulder roast, chuck roast, shank steaks (braising), sirloin steaks, rib eye, T-bone, short ribs, ground beef, as well as sausage and bacon. Cuts will be prioritized for CSA members over farm store sales. We also include pastured chicken and lamb from neighboring farms, and line-caught wild salmon from a sustainable fishermen who we trust. Recipes & Storage Information. We are committed to helping our members use and enjoy all of their food. Friend of the farm and integrative medicine practitioner Jessica Morrison will be sharing recipes inspired by each week's share. Members will also have access to our library of past CSA inspired recipes, organized by vegetable. In addition, we usually offer a weekly sample that often features our meat. Packaging. Part of our motivation to consolidate our CSA pick-up into a weekly event is to reduce packaging. We encourage members to bring reusable bags and containers to fill up with veggies! Purchase Your Summer 2019 Share! You choose 8 or 12 items each week based on what is seasonally available! Email us if you would like to create a payment plan. Add on to your Veggie Share! Email us to inquire about payment plans! Our farm participates in the Vermont Farm Share Program. This program subsidizes CSA shares for our neighbors who otherwise could not afford to join our CSA. Through the program, NOFA-VT will match each dollar that our CSA raises to offer reduced rates to income eligible individuals and families. Every cent donated goes directly towards the cost of a share- and any size donation helps! If you want to become a member of our CSA and are in need of financial assistance, you can learn more about this opportunity and review the application on the NOFA-VT website!